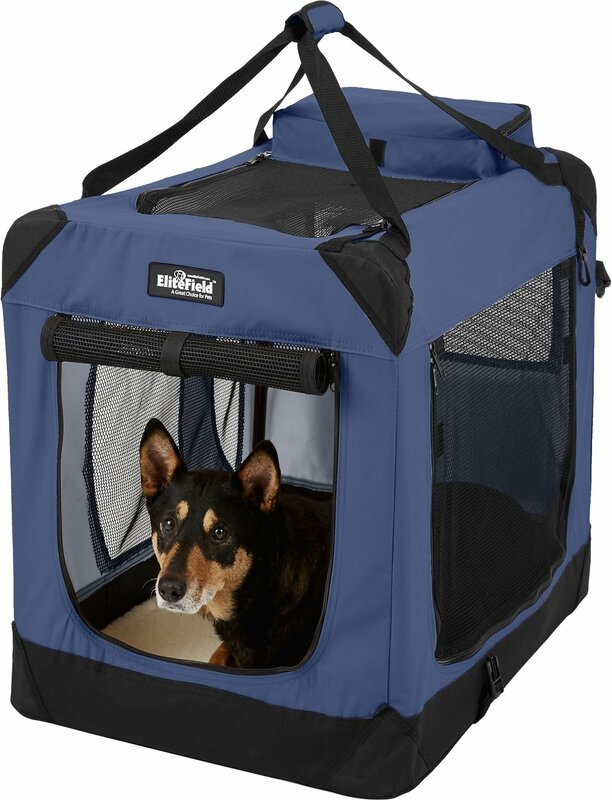 Keep your pet safe and sound with EliteField’s 3-Door Folding Soft-Sided Dog Crate! This sturdy soft-sided dog kennel is the perfect traveling home for your furry friend. 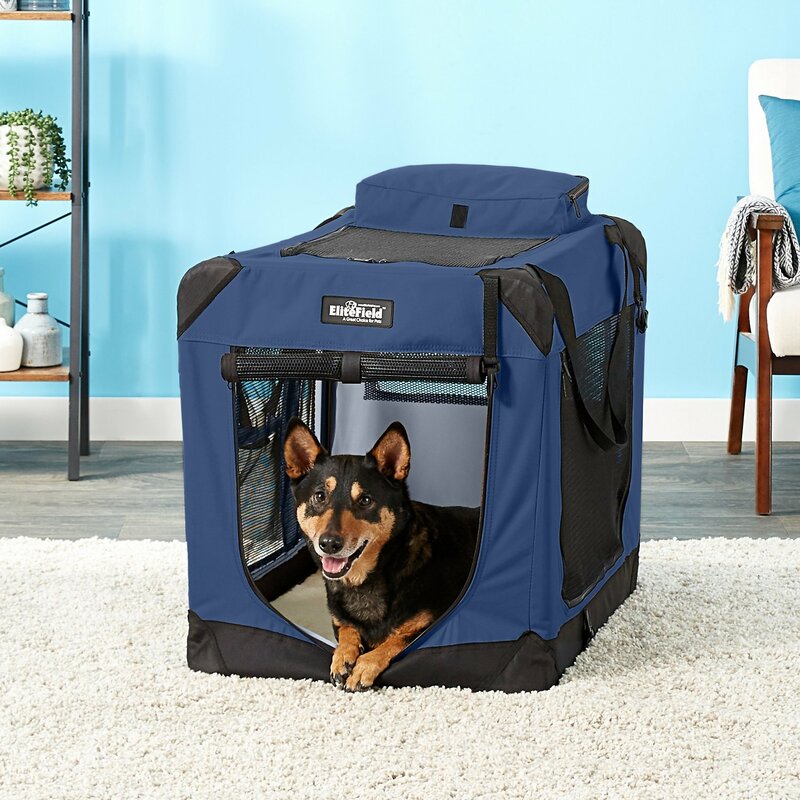 Three zippered doors give your pet multiple ways to enter and exit their new home while also providing the visibility and ventilation needed to keep them comfortable. Made with solid and easy to clean fabric, you can count on EliteField products to last. Plus, both the cover and mat are removable and washable, so you can easily clean up after accidents or simply freshen them up whenever you’d like! This easy to assemble crate requires no tools and sets up and folds down within seconds. 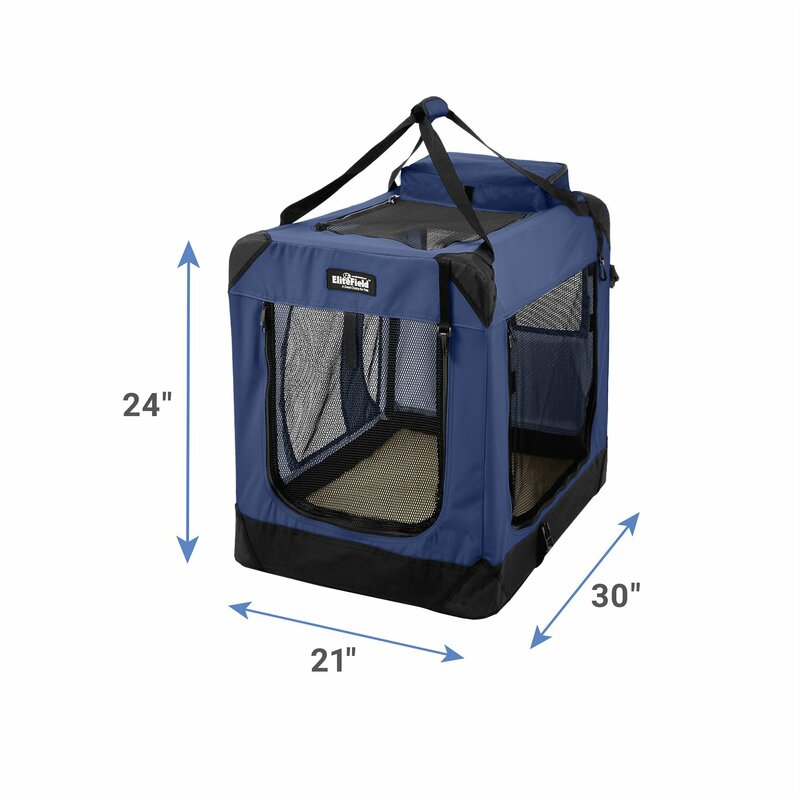 Three mesh doors let in plenty of sunlight and air, so your pet won’t feel claustrophobic. Front and side doors feature locking zippers for added safety and security. 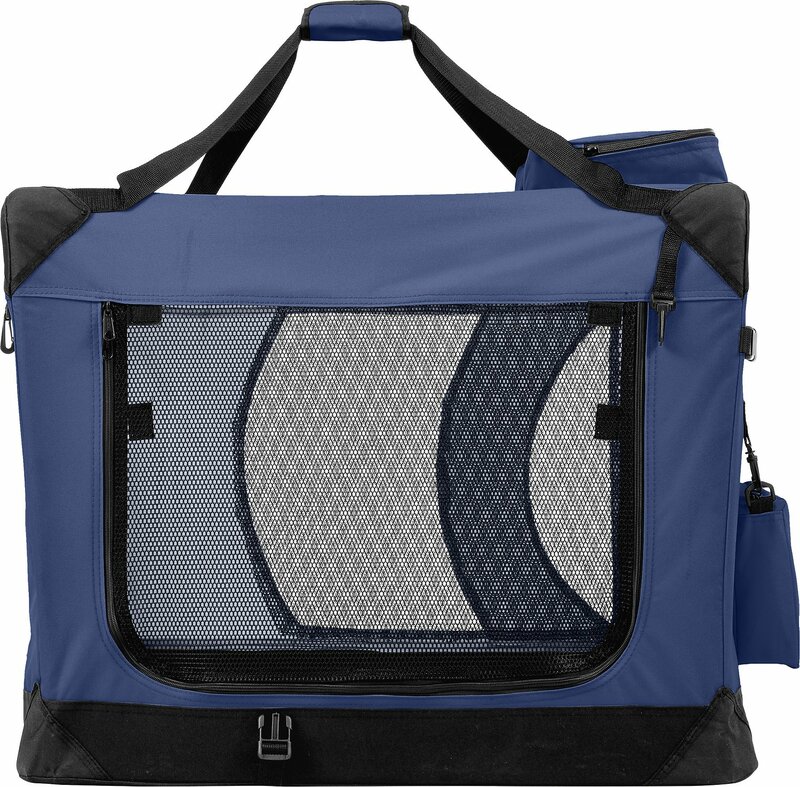 Includes a free carrying case and fleece bed—perfect for traveling with your pooch! Carrying bag and fleece crate mat. Spot clean crate. Mat is removable and machine washable on gentle cycle. Hang to dry. The stitching used to put in the zippers is not strong enough!! Our Lexi is an 11 month rescue mix, easily spooked and a chewer. And now a magician. The first time she was zipped in to the soft crate we left for an hour and returned to find she had managed to unzip the flap enough to get out. Then the second time I zipped her in with the heads of the zipper meeting in the upper right corner. We were gone two hours and she escaped again but this time she broke out all the stitching on one side to weasel her way out. We love this crate! It shipped quickly and we could not love it more. Our dog immediately went in it and she seems more comfortable and calm in this crate than her old traditional metal one. It is extremely easy to put together and the carrying case makes transporting it simple. We brought it to a family gathering and all of our relatives want to buy one as well for their dogs after seeing us put it together in 1 minute. We got the tan color and it is beautiful. Highly recommend. I loved this crate when I bought it. The canvas feels sturdy and even though my dog scratched at the mesh when we first got it, it did not come apart. It's super spacious and airy and my dog absolutely loves her new "home." After a couple of weeks the stitching below the zipper on the front door came apart, it wasn't stitched right from the factory. I contacted Chewy.com and they replaced it immediately without any hassle and I couldn't be happier! I love the product so I'm excited to get one that will last a long time. I like this carrier a lot. It is light weight and easy to move to different rooms or out to the car. It has two zipper pouches for any essential items, a nice pad and folds easily and compactly. Have always liked soft crates due to their versatility, light weight and the fact that they will not mark your furniture or your floors. I love this soft crate for my Doberman. She is very good in her crate and has been crate trained for years. I wouldn't recommend for trying to crate train but a dog already trained this works well. It is much easier to clean than the wire crates and really keeps down on the amount of dog hair that gets out and on the floor/walls around the crate. Also, if you are having visitors, etc. It is pretty easy to fold down and store away. I bought this crate for my rottweiler. I compete at 5 or 6 shows a year and was tired of lugging a wire crate around. I love this crate! It has a storage pocket on top and even a clip on bag on the back. There is a clip for the zipper tag so if a dog scratches the zipper it won’t unzip. It has a fake fleece bed included. And I can’t forget to mention it’s size - it’s wonderfully large. My rottie can easily relax on her side fully without being cramped. The setup and breakdown is super quick and easy. Why did it take me so long to buy this! My Gracie is a 10 lb. yorkie-poo and she loves her new space. I opted for the 24" crate in maroon and it's perfect. It's very well made and spacious for her. I like that the inner supports are metal, not plastic and the nice sherpa type pad keeps her cozy at night. If you're wondering if this ones for you, I would say ABSOLUTELY!! !